....I was there! Front row, Centre Court, opposite his chair! Absolutely fantastic. The reception he got when he walked on court was incredible, and it actually got better each time he came out after a rain break. He looked so happy to be back on court, totally relaxed and as you all know by now, played like a demon. I don't think Youzhny knew what to make of him. He was totally unpredictable, mixing up the shots as well as ever, and whilst a few miles an hour have come off his serve, when it goes well it is unreturnable. He went into the net plenty and the volleys were going pretty well. There was also lots of the cheeky grin, kissing the net and looking to the heavens after net cords, and he just seemed to be having a fantastic time. But he didn't just mess about, he was clearly there to win - as he said himself he didn't want to just walk back on centre court for a last swansong. Playing like he did makes you wonder how he can bring himself to retire. But I guess his shoulder has more of a say in it than he does. I admit to crying like a baby when he won - he looked so happy when he walked off. He was interviewed in the players' restaurant on TV today, and said he was relieved his match today was cancelled as his shoulder was very sore! Not surprising having got to the final of the Boodle and Dunthorne too. He's played more matches in the last week than in the last year! Can't wait to see the next match. Today was the only day I couldn't have gone this week (I was there Monday and Tuesday, having camped out Sunday and Monday nights), but if he plays tomorrow late enough I am going to try to get in and get to Court 2. And if he plays Friday I will be camping out Thursday night and definitely see him. In honour of his win, mate and I had a Croatian flag hanging over our tent on Monday night, which of course went down very badly with all the England football supporters! Hah! I certainly wanted Croatia to win the football too, as I knew how happy it would make Goran. So, sorry for the late match report, but this is the first time I've managed to get online since getting back from soggy southwest London. Am keeping my fingers crossed for him, especially as he only needs two more tournament wins to reach 600. If he beats Volandri that will take him to 559, but he then (theoretically) meets Hewitt! Still if you look at the people he beat in 2001 to get to that final, we know he can do it. And he's got absolutely nothing to lose. PS - Marcus - shame you didn't make it over, it would have been worth it. Hope you're getting decent TV coverage. Thx a lot for the report. good luck for the match GI. i stayed up to watch, but fell asleep (its freezing in Sydney)...then woke up to a reply of the FINAL!!!!!!!!!!!!! wow -i could feel the nerves like it was yesterday. i was cheering like i didn't know who won. come on goran, give us another match, i can't bare to not have you in tennis!!! Anyway: Having the greatest (subjective) tennis-reporter there does it a bit more easy to stay at home:-) Hopefully you can shoot some on-court pictures of him, Emma. And if you get close enough you can even give him a note telling him to surf by [url=http://"http://www.goranonline.com]www.goranonline.com[/url].... I'm sure he would appreciate our dedication! Well, yes, my match report may not be the most evenly balanced ever written, but who cares! Looks like I am relegated to watching the today's match on TV - thank goodness for BBC interactive giving me a choice of courts to watch, as there is no way to get up there in time. Maybe they won't get it finished and I'll be able to get up there to see the end of it tomorrow! Can't believe I am actually hoping for rain for once. Seems unlikely though - the match before it has started, it's only a ladies' and Ruano Pascual is already up 3-1 in the first set. So I reckon he will be on by about 2.30 (UK time). 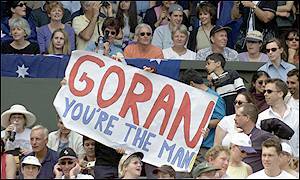 We did have a banner on Monday - it said "GORAN - CHAMPION 2001! - 2004?" I was hoping to put [url=http://"http://www.goranonline.com]www.goranonline.com[/url] at the bottom but I'm afraid we ran out of room. We were disappointed to find that the banner never made it onto TV though! Maybe if we all shout loudly enough at the start of the match from all over the world, he will hear us! I hope everyone who can't see it on TV can keep up with the score on the [url=http://"http://www.wimbledon.org]www.wimbledon.org[/url] Interactive Scoreboard. Well - being in the stands with a big banner surely make you the biggest Goran-fans in Wimbledon anyway. Pitty you cant be there today - but as we all are there in spirit Im sure Goran will give Volandri a hell of a beating! Im still not sure wether they will show Gorans match here in Norway. I have two channels showing Wimbledon - but none of them offer a program.. Hopefully at least one of them will show Goran! I wish that had been me with the banner in 2001! We didn't have the facility to make one that year. However there was a great shot on TV in slow motion of my mate Cathy and I jumping up out of our seats and screaming something I can't repeat during the final. And this year we were on screen for a good 10 seconds in our matching "I'd rather be watching Goran" T-shirts which we wear to every tournament we go to worldwide! Weather is looking worrying for this afternoon. I live about 50 miles south of Wimbledon and we have the most terrible rainstorm, and the clouds appeared to be heading north. Still, I am ready - am at home with two best mates, the Croatian flag hanging in my window and the video set to go. you are right, play suspended - it is 6/2 6/5 30-0 for Ruano Pascal vs Mary Pierce...Goran starts his match after this one!